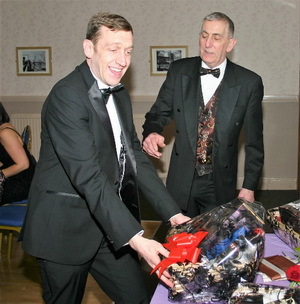 Family, friends and brethren of Sally and Frank Tuzio celebrated their lady’s night in style at Widnes Masonic Hall. The event was well supported by over 50 members and guests and the attention to detail in planning the event proved worthwhile. From the table decorations to the bespoke lighting in the hall, everything was beautifully arranged and co-ordinated. The director of ceremonies for the evening was John Baldwin, who made sure things ran smoothly throughout the night. The chaplain of Victoria Lodge No 4629 Bill Bushell, gave grace, which was followed by a splendid four course meal, consisting of a choice of basil and tomato or leek and potato soup, breast of chicken in white wine sauce, with roast and boiled potatoes and seasonal vegetables, assorted fresh cream gateaux and a selection of cheeses with biscuits. Bill Bushell returned thanks and the loyal toast was proposed by Frank. The toast to the ladies was proposed by John Baldwin, who expressed how lovely the ladies looked and how honoured he felt to be making the toast. The ‘Ladies Song’ was excellently performed in his own inimitable style by Norman Pritchard, accompanied by Keith Dickinson on piano. 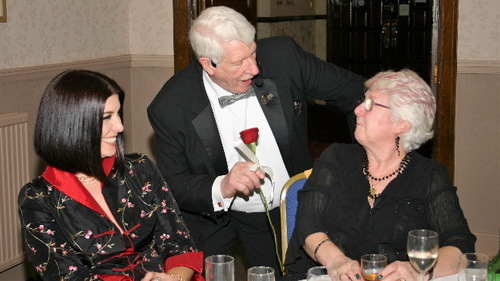 The musical interlude continued with two more songs from Norman, during which he presented red long-stemmed roses to some of the lucky ladies. Sally concluded by thanking everyone for listening and hoped that they would enjoy the rest of the evening. 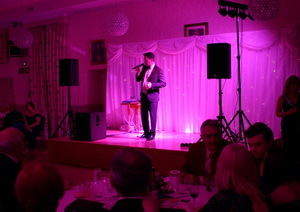 John then handed over to male vocalist Chris G, who provided an excellent evening’s entertainment with a great variety of songs. Before Chris G returned to the stage for his second set, the raffle was drawn and the first prize of a superb drinks hamper was won by a delighted Adam Berrington. To complete a very successful night, Frank thanked everybody for making the evening a most memorable one and for their support throughout the year.